When the first X25-M reviews went live a few people discovered something very important, something many of us (myself included) missed and should’ve addressed: the drive got slower the more you filled it up. It’s no great mystery why this happened, but it seemed odd at the time because it went against conventional thinking. 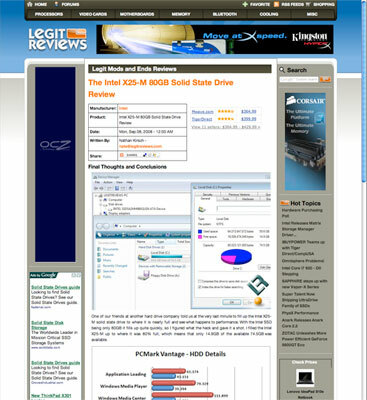 LegitReviews was one of the first to spot the SSD slowdown phenomenon, good work Nate. It’s worth mentioning that hard drives suffer from the same problem; just for a different reason. Hard drives store data on platters; the platters rotate while an arm with read/write heads on it hovers over the surface of the platter and reads data while the platter spins. The diameter of the platter is greater the further out on the platter you go, that’s just how circles work. The side effect is that for the same amount of rotation, the heads can cover more area on the outside of the platter than on the inside. The result is that transfer speeds are greater on the outer sectors of the platter than on the inner ones. OSes thus try to write as much data to the outer sectors as possible, but like beachfront property - there’s only a limited amount of space. Eventually you have to write to the slower parts of the drive and thus the more full your drive is, the slower your transfer rates will be for data stored in the innermost sectors. Fragmentation also hurts hard drive performance. While modern day hard drives have gotten pretty quick at transferring large amounts of data stored sequentially, spread the data out all around the platter and things get real slow, real fast. Randomness is the enemy of rotational storage. Solid state drives aren’t supposed to have these issues. Data is stored in flash, so it doesn’t matter where it’s located, you get to it at the same speed. SSDs have +5 armor immunity to random access latency (that’s got to be the single most geeky-sounding thing I’ve ever written, and I use words like latency a lot). So why is it that when you fill up a SSD like Intel’s X25-M that its performance goes down? Even more worrisome, why is it that when you delete data from the drive that its performance doesn’t go back up? While SSDs are truly immune to the same problems that plague HDDs, they do also get slower over time. How can both be true? It’s time for another lesson in flash.